If and when the Toronto Raptors make DeMar DeRozan available over the offseason, it won’t be the first time in the last year they’ve tested his trade market. When you add it all up, Toronto’s 2017-18 championship prospects couldn’t have been much tastier. This group of Raptors doesn’t sport a long-term outlook anywhere near Boston’s or Philly’s, but the opportunity squandered was massive. That’s why changes are already underway. 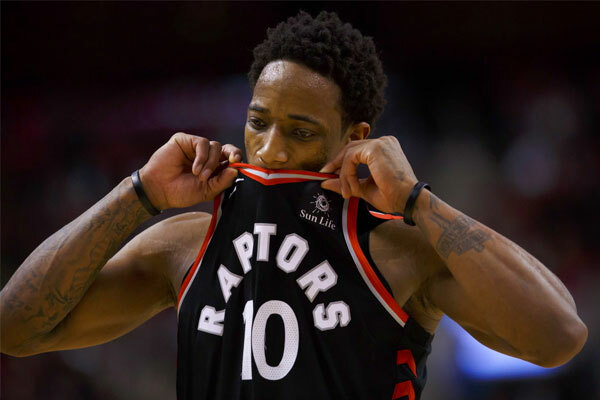 Word is that the Raptors quietly explored their DeMar DeRozan trade options last summer — before they had any inkling that a breakout season was looming — and I’d fully expect Toronto to explore those possibilities again. Not just with DeRozan but with anyone and everyone on the roster. Stein’s last point is perhaps his most important. DeRozan isn’t the only player the Raptors will test the waters on. Expect Kyle Lowry, Serge Ibaka and Jonas Valanciunas to all join him as well. Norman Powell’s name should even pop up. But DeRozan may be the most frequent recipient of speculation. He’s the right mix of valuable and an awkward fit for how Toronto presumably wants to continue playing. The $82.8 million he’s owed over the next three seasons (player option for 2020-21) is steep, but certain teams will consider footing that type of a bill for an established scorer, even one who has yet to hit threes at a league-average clip. Will the Raptors actually move him? And what can they get back for him if they do? Those are questions we’ll have a better hold on leading into this June’s draft. But, at the same time, we should be fully prepared for the chatter to leak deep into the summer.